So, here is the Riverview.world file with the FIXED Resources imported, for people who don't want to mess with their files in S3PE. 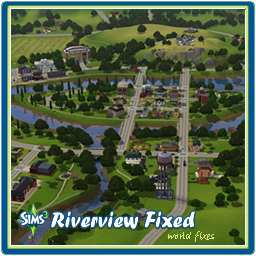 Please read this download thread Resources for Riverview.world's various Fixes for the problems that were addressed. It might even be worthwhile to take the time to read the Comments of that thread, especially if you encounter issues, just so you can check if it has been discussed and addressed before. A close up shot of the Before and After images that you can use as Visual Indicators on how to check if the world file is the original or fixed version. The fixed version has the road sign aligned to the yellow road divider. If you care to continue any legacy games or Saves that you care about in the fixed version, use Twallan's Porter to transfer any Sims or Household you care about from your previous Saves. Delete the *.world file. Or if you want to reuse it after patching, rename it with a ".fixed" extension, so the filename becomes "Riverview.world.fixed"
Feb 04, 2014: Fixed the bodyless windmill issue reported by @Tolkien in the Resources thread. Made while on Patch 1.47. If ever there are any fixes from EA, the changes would come in the Store patches that would show up in Game_Help:TS3_User_Folders_Explained#ContentPatchwiki folder, and not game patches. Or, it could come in a fixed .Sims3Pack that you'd need to redownload and reinstall in Launcher, just like when they fixed the crashing issue when uninstalling the LuckyPalms.Sims3Pack when it was first released. A: There's a file size limitation onsite. If none of the above answers help, the file is also available on my blog. ellacharmed.wordpress.com. Please feedback any issues on this thread as I log in to MTS more often than on Wordpress.